Unlike other Laotian cities with a non-existent nightlife, Vang Vieng stood out as one of Southeast Asia’s rowdiest party hotspots, attracting backpackers with cheap alcohol, drugs, and wild river bank parties. But by 2011, with the accidental deaths of 27 tourists that year alone, the Laos government was forced to intervene and put the brakes on the unregulated disorder. Consequently, many bars were closed, tubing was banned, security tightened, and Vang Vieng almost disappeared from travel itineraries. Cycling is the best and cheapest way to get to the spots we’re mentioning in this post. The terrain in Vang Vieng is almost flat, and the landscape makes the effort worthwhile. If you don’t like pedaling, the second best option is to rent a motorcycle. Motorbike rental: €7,93 (70,000 kip) for a full day or €4,53 (40,000 kip) for half day. Tip: start early to avoid the crowds in the street. One of the big attractions in town is the Nam Song River still being explored for tourist activities—but in a more contained way. These days, you can relax on the small wooden pergolas by the riverbank while listening to music, dipping your feet in the river and drinking a beer. It’s an obligatory must-do in Vang Vieng and just like the Kuang Si Waterfalls in Luang Prabang, its lush surroundings and the turquoise water makes it a super-popular swimming spot. There are swings, a slide, ropes and tree branches serving as diving boards. If you manage to pull off an acrobatic dive you might get a standing ovation from the people below. To reach the blue lagoon by yourself is best to use Maps.me as there’s a lot of misinformation on the way there. Parking fee: €0,23 (2.000 kip) for your bicycle. Right next to the blue lagoon is the entrance to Tham Phu Kham cave. Walking the trail to the entrance is not that easy as the path is quite narrow and steep. The cave itself is huge with a lot to explore but go slow because it’s dark inside and the stones are slippery. Because Vang Vieng is surrounded by caves and because not all caves are the same, we’re going to mention Tham Jang. This cave was used as a hideout from Chinese bandits during the 19th century and unlike others, the chambers inside Tham Jang are paved and well-lit. Also, there’s a small blue lagoon by the entrance where you can swim in. We bought a full day tour from our hostel for €11.30 (100,000 kip) that included: pick-up and drop-off at the hostel, a visit to Tham Sang Cave, water cave tubing, lunch (BBQ skewer, rice, bananas, and water), and kayaking along the Nam Song river. Cheap as chips! Stuff all your things in a waterproof bag, grab a headlamp and jump on a tube! Now, drag yourself by a rope while floating into Tham Nam cave and explore! Tham Nam was dark and narrow, but the experience felt more exciting than claustrophobic. After a 5 minute instruction in broken English, we were going down the river on a kayak passing by other people tubing and frustrated with the slow current. Halfway in, we stopped by one of the few river bank bars still open. We rested, chatted, and drank a beer. The bar had a basketball and volleyball courts where the whole group got to play. Along the river were many abandoned wooden structures from past bars proving we’re not in Vang Vieng golden era anymore. Vang Vieng has the perfect arguments that justify a hot air balloon ride: epic limestone cliffs, rivers, scenic farming villages and great prices. You can go up at sunrise or sunset, but remember to book your ride at least one day in advance. The ride should cost between 65€ (650.000 kip) and 70€ (700.500 kip) from one of the tour agencies around Vang Vieng. Don’t book it online as prices may go up to €130 (1.300.930 kip) for the exact same ride! Who doesn’t like to have dinner with friends? Grab something to eat at one of the many backpacker bars along Vang Vieng main street and watch reruns of the TV Show Friends—it’s always on! 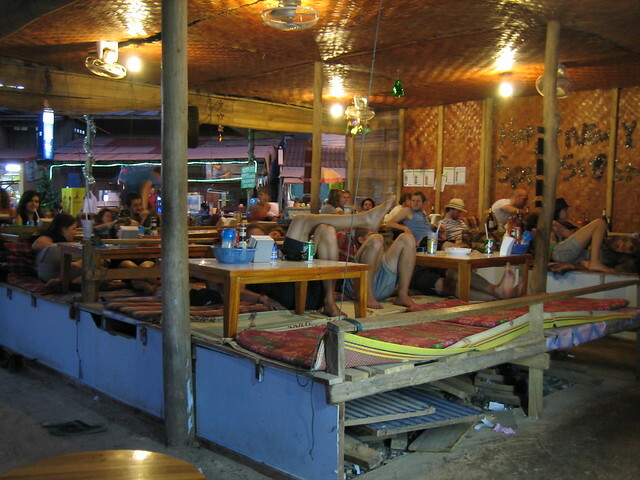 Sakura bar is a staple in Vang Vieng nightlife and famous for its cringy slogan:”drink triple, see double, act single”. Here you’ll find loud music, plenty of cheap booze and free whiskey shots from 8:00 to 9:00 PM. These days, things start to calm down around midnight. If you have any questions or some info to share on Vang Vieng, leave it in the comments below.